Experimental methods are now a mainstream empirical methodology in economics. 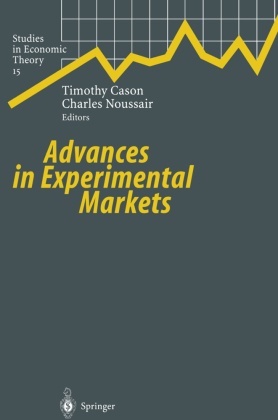 The papers in this volume represent some recent developments in research on experimental markets. The articles span a variety of topics related to experimental markets, including auctions, taxation, institutional differences, coordination in markets, and learning. Contributors to the volume include many of the most distinguished researchers in the area. The experimental study of market behavior.- Concurrent trading in two experimental markets with demand interdependence.- Some factors affecting demand withholding in posted-offer markets.- Firm-specific cost savings and market power.- An experimental comparison of two search models.- Intertemporal pricing in laboratory posted offer markets with differential information.- Dividend timing and behavior in laboratory asset markets.- Bidding up, buying out and cooling-off: an examination of auctions with withdrawal rights.- Markets for contracts: experiments exploring the compatibility of games and markets for games.- An experimental study of coordination and learning in iterated two-market entry games.- Experience-weighted attraction learning in sender-receiver signaling games.- Theoretically robust but empirically invalid? An experimental investigation into tax equivalence.